Krytyka Polityczna (Political Critique) was first published in 2002, creating the foundation for a host of associated activities. Today it is the largest intellectual periodical in Poland and plays a key role in the country’s cultural and political life. It publishes journalism, political philosophy, sociology, literature and literary criticism, and showcases contemporary art, film and theatre. Krytyka Polityczna has a distinctly leftwing political profile, but is open to voices from across the political spectrum. Each issue is devoted to a single core issue accompanied by regular columns – from photo-essays by Polish and international visual artists (including Anna Baumgart, Sanja Ivekovic, Wilhelm Sasnal, Pawel Althamer and Santiago Sierra) to in-depth interviews by Slawomir Sierakowski or Michal Sutowski. The magazine’s art editors are Yael Bartana and Artur Zmijewski. 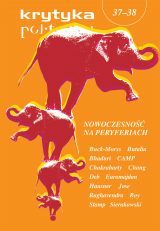 As well as Polish authors, Krytyka Polityczna has published well-known international writers and intellectuals including Ulrich Beck, Frédéric Beigbeder, Judith Butler, Jürgen Habermas, Michel Houellebecq, Chantal Mouffe and Ernesto Laclau, David Ost, Michael Walzer, Hayden White and Slavoj Zizek, among many, many others.